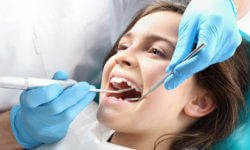 As children grow older, they are faced with a new set of dental health threats. Just as thumb sucking can affect toddlers’ teeth and eating too much sugar can cause cavities in younger children. 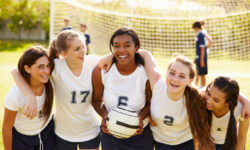 Teenagers, too, are at risk for their own dental health issues. Read on to learn more. On a hot summer day, chewing ice might seem like a refreshing way to cool off. Needless to say, snow cones made from shaved ice are a delightful summer treat. But, while the occasional ice-based dessert won’t do much harm to your child’s teeth, chewing ice cubes or crushed ice can. Here are a few reasons to break the habit for good. Nearly half of all children will develop a cavity in at least one of their baby teeth. 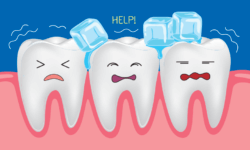 Luckily, there are many ways to treat and even prevent tooth decay. Specifically, silver diamine fluoride (SDF), a liquid substance that helps prevent tooth cavities, is a safe and effective treatment for young children. Read on to learn more. It’s nine o’clock on a school night, and your kids are getting ready for bed. Some days, just the simple act of brushing their teeth is a hassle. Even more, trying to get them to floss seems like an impossible task. But, there are several health benefits that make flossing more than worth the effort. 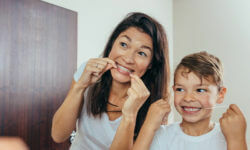 Read on for some fun facts about flossing and why it should become a part of your family’s daily routine. Do your child’s teeth appear discolored? If they’re not as white as he/she wants them to be, you may be thinking about tooth whitening as an option. Before you start looking into whitening products and procedures, it’s important to know the truth about tooth whitening.